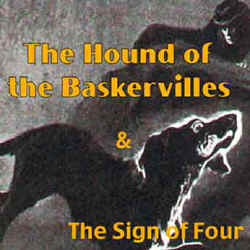 The Sign of Four by Arthur Conan Doyle was the second Sherlock Holmes novel, published in 1890. The unabridged reading provided here is performed by Patrick Horgan. Format mp3 file by chapter for download ~ 220 MB zip file. "A Study in Scarlet", the first Holmes book, had gone through several editions when an American editor of Lippincott's Magazine decided to ask for another volume to make up a companion edition. He invited Doyle to lunch for the purpose along with Oscar Wilde. What a treat it would have been to be a fly on the wall during that meeting! The result was the second Holmes book, and "The Picture of Dorian Gray". One may suspect that the character of the super aesthete Bartholomew Sholto owes a little to Wilde, who had already been satrized in "Patience", a work by another Sir Arthur. The magazine edition appeared in London and America in February 1890, and the book came out a few months later. It commences with the first appearance of the famous hypodermic containing the "seven percent solution" which signals that Holmesis bored with life, and goes on to mention Watson's legacy from his time in Afghanistan. Now he suffers from a wounded leg, whereas when he met Holmes in the first book it was a shoulder injury, described in medical detail. Clearly things are occurring on more than one level. Mary Morstan, later to become Mrs Watson, wants Holmes to come as a witness to the rediscovery of the treasure stolen by four men in India, including her father as an accessory. When they reach the house of Bartholomew Sholto they find him murdered under very peculiar circumstances, and the treasure is missing. Was the murderer a child or a monkey? Holmes figures it out, and as in the first book there is a long overseas flashback to the circumstances of the theft in India.